Organizational Culture, Work Commitment, Islamic Work Ethic and Employee Performance. The Paradigm of employee management, that the key success of organizational is human capital in comparably to financial capital. Eemployees should be a catalyst for other resources and create creating value for all stakeholders. The Transformation of management through human capital development encourages the performance of employees of the city government is good. Bernardin & Russel (1993) employee performance is identical to achievement, and responsibility. Robbins et al., 2015 factors of ability, motivation and opportunity influence the employee performance. While, Matei & Chesaru (2014) stated governance, public services, poverty alleviation, and power decentralization are not in line with expectations. Alon & Hageman (2013), government related to the quality of public services, bureaucracy, the competence and political independence. The problem of nepotism, collusion and corruption is still symptomatic, a condition with transactional, less ethical. Islamic work ethic has potential to give positive energy to the performance of employees, because of the beliefs of Islamic teachings and values. Work is worship, has an element of kindness and blessing. At-Taubah (9: 105) and say, you work, then Allah will see your work, so will His Prophet and the believers, and you will be returned to Allah who knows the unseen and the real, then preached Him to you what you have done. Ali & Al-Owaihan, 2008 Islamic work ethic with organizational commitment, shows a positive relationship. EKI contains inner self, inner being to act rationally and believe that the highest dedication of man is only to Allah SWT (“hablum minallah”), and beneficial to fellow human beings (“hablum minannas”). These underlying EKI research, faith-based work has a range of meanings, eternities, which encourage employee performance and bring benefits to the employees and organizations. The problem is how employees use EKI as the foundation of work and affect the performance of employees. The BO domain concerns the value, the norm that becomes an integral part of effective change for the organization, in anticipation of turbulence. Robbins et al., 2015 primary cultural characteristics, consisting of innovation and take risk, attention of detail, outcome orientation, people orientation, orientation, aggressive and stability. Ideally BO is a prerequisite for a good and continuous organization, when the organization has a stable and continuous BO, then the organization becomes good. Good Ali & Al-Owaihan., 2008 BO research, realizing vision, maintaining stability. Work commitment, encouraging employees to survive as members of the organization. Mowday et al. (1982) acceptance of organizational goals, willingness to work hard and desire to survive to be part of the organization, according to Allen & Meyer (1990) there is affective, normative, and sustainability commitment. Vance (2006) work commitment includes pride, loyalty to the organization. Interesting issues of how effective BO and work commitments mediate EKI on employee performance. This research uses survey method. The populations are civil servants who are included in the work unit and are Muslim. Samples were taken using Slovins’ formula (Sanusi, 2013) with alpha 7%=178 respondents, with the proportional random sampling. Data was taken on April to July of 2017 with quisionaries. A characteristic of respondents is dominant in age 49-50 years, with a long working 26-31 years. 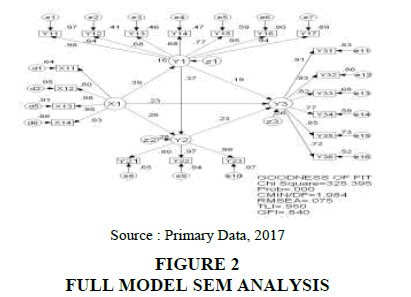 Data analysis techniques uses confirmatory factor analysis and Structural Equation Modeling (SEM).Conceptual framework, Islamic work ethic describes compliance, inner being, essential being, work spirit based on Islamic values, establishes ideal regulation and internalization that influence the employee performance. The organizational culture, forming characters based on basic assumption, value and belief, differentiates with other organizations. Work commitment includes pride, loyalty to the organization. Contains the meaning of self-reflection, to remain in the organization and willing, emotionally and intellectually bound. The role of BO and work commitment as well as endogenous variable also acts as mediation to see the level of effectiveness. The conceptual framework can be described as follows. H1: If EKI underlies employee work, it has significant influence to BO and work commitment. H2: If EKI underlies employee work, it has a significant effect on employee performance. H3: If the BO is good, it has a significant effect on employee performance and work commitment. H4: If employees have a work commitment, significant effect on employee performance. H5: In total EKI gives a significant influence on employee performance through BO and work commitment. The result of descriptive analysis, employee performance is reflected by interpersonal, work quantity, supervision, work quality, work effectiveness and punctuality, appreciated and dominantly reflected by interpersonal, with supportive cooperation. Work commitment reflected by normative commitment, sustainable and effectiveness, appreciated and dominantly by normatives commitment, obedience and compliance with applicable regulations. Islamic work ethic variable, reflected by honesty, trustworthy, communicative character, and intelligent, appreciated and dominantly reflected by honest nature, work sincerely for Allah. Variable of organizational culture, reflected by innovation and risk, detailed attention, result orientation, human orientation, team orientation, aggressiveness and stability, means appreciated and dominantly reflected by innovation and risk, with clear operational procedures standards, protecting employees. The test of analysis SEM assumption of normality, observe the value of critical ratio skewness with multivariate value, are in the range of -2.58 to 2.58 qualify for normality. Known C.R. multivariate value of 1.82, means assumption of multivariate normality tested. Outlier test results show the observation number of 1 to 178 is smaller than chi-square table (α=0.001; df=220) of=290.55. Distribution at centroid point range, shows eligible observation data. The result of analysis of multicolierity is no relationship between high manifest variables (r<0.90), structural equation model analyzed does not occur multicollinearity. The result of SEM analysis, Confirmatory Factor Analysis test knows the construct former of research variable and causality analysis, the result lead to Figure 1. Loading factor of employees’ performance is the largest estimation of the work quantity as a contract former of employee performance variable of 0.93. The largest estimation model of Islamic work ethic is the mandatory nature as construct former of Islamic work ethic is 0.98. The greatest organizational culture is estimation model of innovation and risk as construct former of organizational culture is 0.98.The loading factor of work commitment, the greatest estimation model of normative commitment as a construct of work commitment variable is 0.99. X : Islamic Work Ethic. Test of suitability of model: goodness of fit and statistic test toward full model of SEM, show chi square value 325.395>chi square table 290.55 with sig 0.000<0.05 which mean fulfill good criterion, that covariance matrix between prediction with observation is same, model is fit. While CMIN/DF result: 1.984 ≤ 2.00 means good, RMSEA result: 0.075 ≤ 0.08 means good. The coefficient of Islamic work ethic effect on employee performance=0.23, the coefficient of Islamic work ethic effect on organizational culture=0.39, the coefficient of Islamic work ethic effect on work commitment=0.26.Coefficient of organizational culture effect on employee performance=0.19, coefficient of organizational culture effect on work commitment=0.37. Coefficient of organizational culture effect on employee performance=0.23. The result of fit model test of chi square value is 325.395>from chi square table equal to 290.55 with sig 0.000<α=0.05 which mean meet the good criterion, covariance matrix, it can be concluded there is no difference between the sample covariance matrix and the matrix of estimated population covariance, means that the model is fit. Hypothesis test result based on critical ratio value and sig value. C.R. ≥ 2.00 and sig.<α=0.05 as a condition of acceptance of hypothesis. The result of C.R. value and sig level is between the hypothesized variables. Islamic work ethic underlies employee work, affects organizational culture and employee commitment, critical ratio value to organizational culture=5.53 followed by p value=0.00. Islamic work ethic against employee commitment=3.63 followed by p value=0.00. Means that tested Islamic work ethic significantly effect on the organizational culture and work commitment, means that it qualifies acceptance of working hypothesis. The second hypothesis of Islamic work ethic underlying the employee work, affecting employee performance, is proved by the value of critical ratio of employee performance=2.96 followed by value p=0.003<0.05 means that variable of Islamic work ethic proved to have significant effect on employee performance, means that it qualifies the acceptance of the working hypothesis. The third hypothesis of organizational culture on employee performance and employee commitment, proved by C.R. value to employee performance=2.38 followed by p value=0.017<0.05 and employee commitment=5.07 followed by p value=0.00<0.05 means that organizational culture proved to have a significant effect on employee performance and organizational commitment, means that it qualifies the acceptance of the working hypothesis. The fourth hypothesis of work commitment to employee performance, evidenced by the value of C.R. employee performance=2.86 followed by p value=0.004<0.05 means to meet the acceptance of working hypotheses. The fifth hypothesis of direct influence and total influence, the result of Islamic work ethic total influence significantly to employee performance=0.400 through BO=0.276 and organizational commitment=0.232. The effect of total direct influence hence the hypothesis shows that Islamic work ethic significantly influence to employee performance through organizational culture and organizational commitment is tested, it means Islamic work ethic effectively influence employee performance through organizational culture and employee work commitment. Islamic work ethic underlies the employee work and employee commitment. Organizational culture will be effective when Islamic work ethic is more intensively run. Similarly, work commitments will be effective when Islamic work ethic is more intensively enforced. Islamic work ethic is described by the nature of trust as its construct, working responsibly. The commands of Al-Taha (20: 13-15). Al-Ma'arif (70: 32-33) keeps their trust and their promises, followed by the self-awareness of producing strong organizational culture. Effective work commitment when Islamic work ethic is more intensively implemented, through the trust of carrying out the full responsibility of work as our prophet had adviced trough Al- Ahzab (33: 21). This reinforces the work commitments of employees to always obedient to the applicable regulations. A trustworthy employee gives rewards and accepts the goals of the organization. Similar research by Hayati & Caniago (2012), Begum (2015), and Salahudin et al. (2016) that Islamic work ethic underlies employee work to employee work commitments. Employee performance will be more effective when organizational culture more intensively runs, reflected by innovation and risk, with clear standard operational procedures that protect employees. Robbins et al. (2015) organizational culture functions to forming attitudes and behavior to force employee performance. Amrizal (2011) organizational success is not separated from corporate culture. Effectiveness is reflected in trust, and subordinate support. Employee commitment will be good, when organizational culture is more intensively run as the research of Rashid et al. (2003), Chen (2004), Syauta et al. (2012) organizational culture has an effect on organizational commitment. Employee performance will be more effective when work commitments intensively executed. Work commitment reflected by normative commitment, obedient employees and obedient to the applicable regulations, as research of Meyer & Allen (1991), Davis & Newstrom (1999) factors for employee commitment, personal factors, work, structure and work experience. Yousef (2001b), Chen (2004) reinforces the theory of social exchange theory Cropanzano & Mitchell (2005), that commitment will be achieved if there is a match between desire and organizational expectations, and the effect on performance improvement. This can be achieved since the recruitment, which meets the criteria, abilities and skills as well as good moral ethics. Achieving good and optimal performance is the process of functional interaction between ability, spirit and opportunity. Organizational culture and work commitments have become the benchmarks for Islamic work ethic alignment to better guide employee performance. The position of organizational culture and work commitment are strategic enough for Islamic Work Ethic with the nature of trust underlies the employee performance. Al-Fath (48: 18) He knows what is in their hearts, gives peace with victory. This condition convinces what is earned depends on the deeds. According to Yousef (2001b), Chen (2004) and Cropanzano & Mitchell (2005) organizational culture and work commitments are achieved when there is suitability between wishes and organizational expectations and influences on employee performance. Organizational culture and work commitments become benchmarks for Islamic Work Ethic to improve employee performance, reflected by interpersonal, with cooporation. The position of organizational culture and work commitment for Islamic Work Ethic is very strategic. The implications of growing an emotional bond, sense of belonging that encourages the improvement of employee performance, is reflected by the quantity of work, with the achievement of the established work target. Islam does not want its people to work at random, lazy. Work is worship, part of the struggle of human dignity and economic degree of people, always working hard, discipline and honest to improve employee performance. For generalization of management science related to organizational behavior, this research can be developed more widely, involving other work units of regional government, with a more comprehensive theoretical perspective. This research cannot be separated from the participation of many parties. To all those who have given moral and material encouragement are delivered thanks. Particularly convey thanks to the Directorate of Research and Community Service. Directorate General for Strengthening Research and Development of Ministry of Research and Technology and Higher Education who has awarded doctoral dissertation under contract No. 041/SP2H/K7/KM/2017 dated April 10, 2017. Abdul R. Z., Sambasivan, M., & Johari, J. (2003). The influence of corporate culture and organisational commitment on performance. Journal of Management Development, 22(8), 708-728. Ali, A. J., & Al-Owaihan, A. (2008). Islamic work ethic: a critical review. Cross cultural management: An International Journal, 15(1), 5-19. Allen, N. J., & Meyer, J. P. (1991).The measurement and the antecedents of affective, continuance and normative commitment to the organization. Journal of Occupational Psychology, 91, 1-18. Alon, A., & Hageman, A. M. (2013). The impact of corruption on firm tax compliance in transition economies: Whom do you trust? Journal of Business Ethics, 116(3), 479-494. Amrizal, (2011). Building internal culture and ethics of anti-cheating organizations. UGM Yogyakarta. Begum, R. (2015). Impact of Islamic Work ethics on work outcomes of employees with personality conscientiousness as moderator variable in the banking sector of southern Punjab. Journal of Philosophy, Culture and Religion, 12, 52-60. Bernardin John, H., & Russel Joyce, E. A. (1993). Human recources mangement an experiental approach. Singapura. Mc Grae-hill. Chen, L. Y. (2004). Examining the effect of organization culture and leadership behaviors on organizational commitment, job satisfaction, and job performance at small and middle-sized firms of Taiwan. Journal of American Academy of Business, 5(1/2), 432-438. Davis, K., & Newstrom, J.W. (1999). Human Behaviorat Work: Organization Behavior. McGraw Hill Book Company NewYork. Hayati, K., & Caniago, I. (2012). Islamic work ethic: The role of intrinsic motivation, job satisfaction, organizational commitment and job performance. Procedia-Social and Behavioral Sciences, 65, 1102-1106. Kementerian Agama, R.I. (2013). Alqur’an the Wisdom. Yayasan Penyelenggara/PenafsirAlqur’an, Penerbit PT AkuBisa, Jakarta Selatan. QS Al-Anbiya (21:107), QS Taha (20:13-15), QS.Al-Ahzab (33:21), QS. At Taubah (9:105), QS. Al-maarif (70:32-33), QS. Al-fath (48:18) (HR. Ahmad). Matei, L., & Chesaru, O.M. (2014). Implementation guidelines of the new public management. cases of Romania and Sweden. Procedia-Social and Behavioral Sciences, 143, 857-861. Ministry of State Secretariat, Republic of Indonesia Law No. 5 of 2014 on State Civil Apparatus, enacted in the State Gazette of the Republic of Indonesia Number 5494. Mowday, R. T., Steers, R. M., & Porter, L. W. (1982). Employee-organizational linkages: The psychology of commitment, turnover, and absenteeism. Robbins, S. P., Judge, T. A., & Millett, B. (2015). OB: the essentials. Pearson Higher Education AU. Salahudin, S.N., Baharuddin, S. S., Abdullah, M. S., & Osman, A. (2016). The effect of Islamic work ethics on organizational commitment. Procedia Economics and Finance, 35, 582-590. Sanusi, A. (2013). Business Research Method. Publisher Salemba Empat, South Jakarta. Syauta, J.H., Troena, E.A., & Margono S.S. (2012). The influence of organizational culture, organizational commitment to job satisfaction and employee performance (study at municipal waterworks of Jayapura, Papua Indonesia). International Journal of Business and Management Invention, 1(1), 69-76. Tasmara, T. (1994). Muslim personal work ethic. Dana Bakti Wakaf. Vance, R. J. (2006). Employee engagement and commitment: A guide to understanding, measuring and increasing engagement in your organization. SHRM Foundation. Yousef, D.A. (2001b). Islamic work ethic-A moderator between organizational commitment and job satisfaction in a cross-cultural context. Personnel Review, 30(2), 152-169.